Hey Heidi, that would be fine to post. I wrote up my thoughts about the Nutting's and have tried several unsuccessful ways to post it to TEXBIRDS. If you want to use any of it on your blog, that would be fine too. Yesterday, John Arvin alerted me to the fact that a possible Nutting's Flycatcher had been seen in Big Bend and sent me a link to some photos. 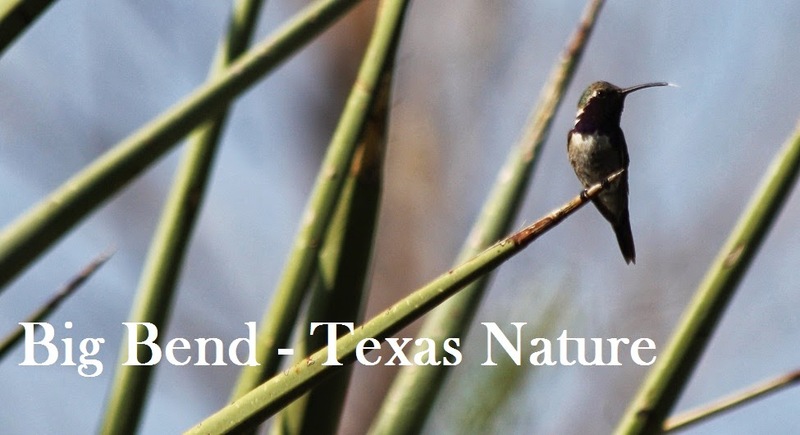 I also listened to Heidi Trudell's video grabs that contains a few vocalizations of the Big Bend bird. I am fortunate enough to see Nutting's Flycatcher on a pretty regular basis (as well as some of its congeners too), and believe that both the photos and the audio support the identification of Nutting's. While the fidelity of the recordings is poor, it does document one of the characteristic sounds of Nutting's, a two-noted stutter call. I'm used to hearing the call when birds are slightly more vocal and excited than the bird in the video, but it matches quite well with a comparative example from a Nutting's I recorded in Oaxaca. Steve Glover is right to express caution over trying to identify Myiarchus by sight/photos alone. Nutting's and Ash-throated are indeed very similar. And photos can be particularly deceptive at times. Voice is clearest means of identification. Mouth lining color is often tricky to see and frequently equivocal or mis-interpreted. A really bright orange color would be diagnostic, but pinky-orange, not so much. Structure is pretty good. Nutting's is a smaller bird, sometimes looking more round-headed (depending on mood) and overall more delicate than Ash-throated. It tends to be more brightly colored, with lots of browns on the head, and lacking gray feathering on the forehead and less around the nape, compared with Ash-throateds. It is also shorter-billed than an Ash-throated. These features can be seen in the published photos. The edgings on the secondaries and primaries are more blended than on non juvenile Ash-throateds. That is, once an Ash-throated has undergone a preformative molt, the rusty edged primaries contrast pretty sharply with the more whitish edges secondaries. There is less contrast in Nutting's, with the outer secondaries being more buff-dull rufous colored, thus contrasting less with the primaries. This pattern can be seen on the Big Bend bird. I suspect what confused some birders viewing the Monterey, California bird mentioned by Steve was the retention of a few rusty-edged juvenile secondaries (typically present on birds in formative plumage), which diminished the apparent contrast between primaries and secondaries. The Big Bend bird shows a classic Nutting's tail pattern too. A similar pattern is only rarely shown by Ash-throated, and in such instances, there is still usually greater contrast between the brown and rufous bits (i.e. Nutting's has a more blended tail pattern blurring the boundaries between brown and rufous). I guess it is worth mentioning that the above applies to the inquietus subspecies of Nutting's since southern populations are somewhat different either in plumage or voice.